You can never predict what will draw an audience. In the world of television, success is a fickle thing. Many shows have come and gone, some had the chops to make it past the initial first season but due to any number of reasons they were unable to make it. Others however have whatever that "x-factor" is which keeps them on the air past the first year and well into many seasons. To try and list all of these shows would not only take forever but is also open to conjecture because for many shows and fans it is a matter of opinion about what is good and bad. So let's focus on one show and that's How I Met Your Mother. When the show first hit airwaves back in 2005 no one could have predicted the kind of success it would have. When you hear the premise it is hard to imagine the show lasting as long as it has. Essentially it follows the adventures of a young man living in New York City as he searches for "the one", each episode is narrated by that same protagonist as an older man as he tells the story to his children of how he met their mother. The narrator in question is none other than Bob Saget, who plays the older version of Ted, though we don't ever see his face. The younger version is played by Josh Radnor. He is accompanied on his adventures by his fellow compatriots Barney (Neil Patrick Harris), Marshall (Jason Segel), Robin (Cobie Smulders), and Lily (Alyson Hannigan). Initially the show attempted to push the idea that it was Robin whom Ted was destined to be with, but now as the show has made it to 6 seasons it has become unclear who the lucky girl is since the show established that Robin is "Aunt" Robin to Ted's future children. Now the sixth season comes to DVD and all of the hilarity that transpired is yours to watch at your leisure. The motto for this season was "the more things change, the more they get interesting". Ted still searches for the one though the show doesn't waste the audience's time with repetitive story lines where he bemoans his lonely existence. If it did the show would not have lasted very long. Marshall and Lily, now happily married, are ready to take the next step in their lives by having children. Robin finally is able to feel like a real New Yorker while Barney, the wild man of the group, begins the lengthy and humorous search for his father. Some of the more stand out episodes involve some fantastic guest stars like Katy Perry and Jorge Garcia as "The Blitz". No matter if you have been a loyal fan since season one or are simply looking for a really good laugh, How I Met Your Mother never fails in bringing you stellar enjoyment that will leave you in stitches for hours. Now season six arrives on a 3 disc set for all those fans that anxiously wait to add it to their collection. It comes packed with some fantastic and funny extras like commentary on selected episodes, a making of the "Subway Wars", deleted scenes, a behind-the-scenes look at "Glitter", a gag reel, a look into what the audience has learned so far about Ted's future wife, and finally an extended performance of "Stand by Me". Clearly the makers of this show know what the audience would like to get a sneak peek at and have given us the best from season six. It is always rewarding to see a show that might not have made it, find success. In television shows come and go, but to find one that is allowed the chance to grow past its confines gives an audience member a sense of being part of something bigger than them. So here is to How I Met Your Mother and hoping that one day soon we find out who this darn "wife" is! 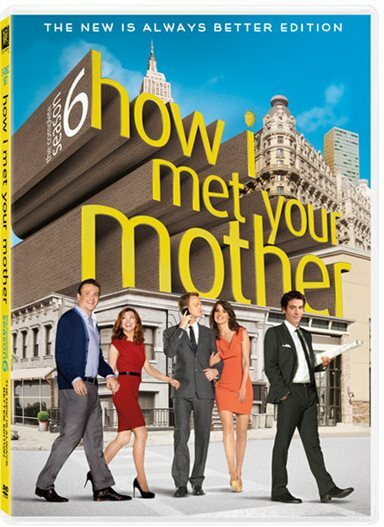 Download How I Met Your Mother: Season Six from the iTunes Store in Digial HD. For more information about How I Met Your Mother visit the FlickDirect Movie Database.